This is one of my favorite dishes at my local all vegan Thai restaurant. I usually have it with brown rice and add more chili paste for extra heat. Add the TVP and stir to fully incorporate. Continue cooking for about 5 minutes. If it seems too dry, add more stock. Add the mint and garlic and stir. Add the bell pepper and cover. Before serving, add the fresh mint. Serve with brown rice. You can also serve it in lettuce leaves like a lettuce wrap. This is delicious and fairly easy. I make a quick sauce using San Marzano (I used Cento) Whole Tomatoes for the sauce. They are the best canned tomatoes you can buy and they can only say San Marzano if they are from San Marzano Italy. 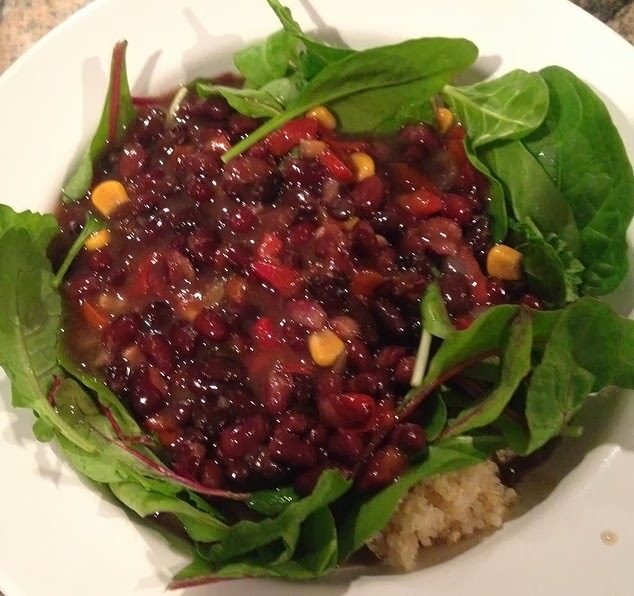 I also use black rice which I've used in other recipes here. It's got a nutty taste and adds a nice bite to the dish. Add lots of baby spinach and fresh basil. First I slice the eggplants into discs and I put them on a cooling rack over the sink, but you can make whatever contraption works for you. Salt both sides of the eggplant. Do all of them on one side first then flip and do the second side. The reason for this is by the time you're done salting them all on one side, the salt on the first ones will begin to stick as the salt draws out the liquid. The purpose of all this is to draw out the liquid which can be bitter. Leave them over something to drain (I'm doing it over the sink). When they've been draining for about 30 minutes of more, rinse them off and pat them dry. Preheat the oven to 375. Put the two cans of tomatoes into a blender or food processor along with the garlic and 1 teaspoon of sea salt and 1/2 teaspoon of black pepper. Blend to smooth. Depending on the size of your blender or food processor, you may need to do this in batches. If you do it in batches, pour everything into a large mixing bowl and stir together so it's evenly mixed. You can add the red pepper flakes at this point if you're using any. Slice the eggplant into one inch slices. Put a thin layer of sauce at the bottom of a lasagna pan. Add the eggplant. Pour more of the sauce over the eggplant. Break the lasagna noodles into small, irregular shaped pieces and sprinkle these over the sauce and stir the mixture so everything has some sauce on it. Add the spinach and basil over the sauce and cover this with more sauce. Add a layer of the black rice over this and cover with the remaining sauce. Cover the pan with aluminum foil and bake for 1 hour. Uncover and check the eggplant to see if it's soft. Once it is, you're done. Many people have asked me how you begin the change to a Whole Food Plant Based Diet (WFPB). Do you gradually ease into it or do you just go cold tofurkey? After completing The Plant Based Nutrition courses at eCornell University, I remember this coming up in a discussion. I, personally, went cold tofurkey! While watching my dad go from a stroke to dementia I knew I wanted to make quick and permanent changes to the way I looked at food. For others this may not be the motivating force behind a desire to make changes in your diet. One of the suggestions during the class discussion was fasting, either water or juice. That always sounded harder to me than just cutting the line I so tightly held to meat, fish and dairy, but everyone's different. I came across a couple of articles from the T. Colin Campbell Center for Nutrition newsletter. There are great articles at Nutritionstudies.org with loads of information about plant based nutrition, but the article on a water fasting aka a cleanse. The science behind it is explained in the article. Whenever you embark on something that affects your health, always let your healthcare professional know what you're doing so they can monitor the results. If for no other reason than you will get a starting point and results point. If more people let their doctor's in on their WFPB journey, you will be aiding the healthcare community about nutrition which they are not required to learn as part of their education. The title has nothing to do with the taste....just like the name of this ancient grain Freekeh. 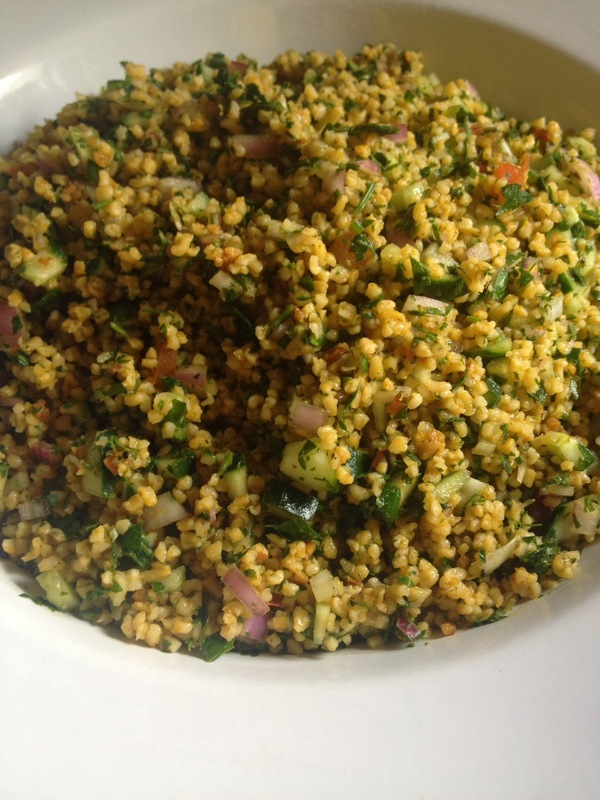 I made this into a Tabbouleh so we have a Freekeh Tabbouleh. This packs a lot of protein, about 11+ grams per 8 oz serving. I had it as a side dish the first night and as dinner the next. If you have a rice cooker add the Freekeh and Stock and cook it on the white rice setting. If you don't, boil the water, add the Freekeh and reduce to simmer. Cover tightly and cook until tender or all of the stock is absorbed, about 20 minutes. Fluff with a fork. In a large bowl add all of the vegetables. In another bowl add the lemon juice, vinegar, salt and pepper and mix well. Pour the dressing over the vegetable and Freekeh mixture and mix well (I like to use my clean hands for this as you can really mix it well). That's it. 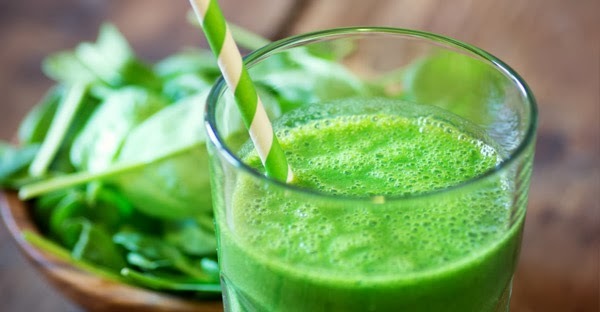 Easy and delicious as well as packed with nutrients and more importantly, n(o)il. You can certainly play with the ingredients according to your taste buds. Once you have the Freekeh made it's a blank slate. Be creative. Costco's Kirkland all organic black bean no oil soup with Costco triple washed deep green organic power blend greens and Trader Joes ready Cooked Frozen Quinoa. Easy way not to cook for a change!